Lord, in your kindness hear our petitions. You called Andrew the apostle to preach the gospel and guide your Church in faith. May he always be our friend in your presence to help us with his prayers. We ask this through our Lord Jesus Christ, Your Son, who lives and reigns with You and the Holy Spirit. Amen. Amen. Today the Church celebrates the feast of St. Andrew, apostle. 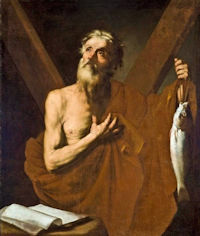 St. Andrew, the brother of St. Peter, is one of the apostles who has been held in special honour. He was the very first of the disciples to know Jesus; at the Master's call he at once left his nets and followed Him to become a "fisher of men".